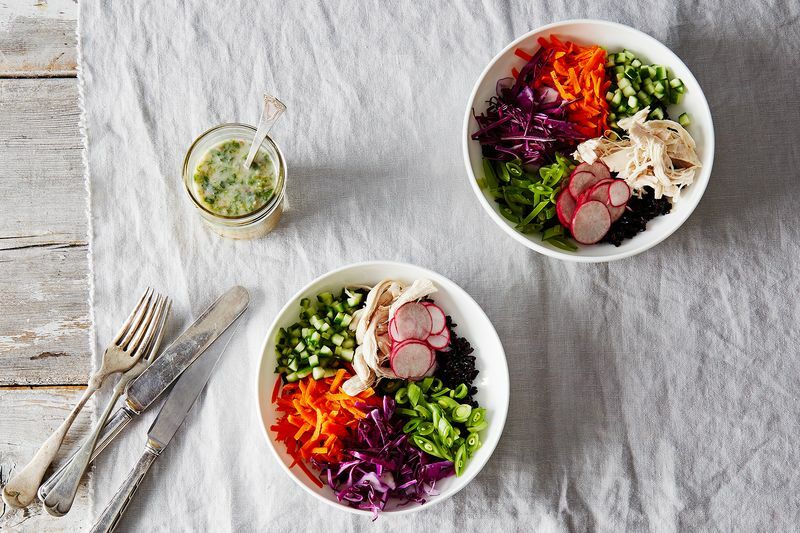 The star of this rice bowl isn't the shredded chicken or the assortment of raw vegetables, it's the fish sauce-spiked dressing. Take a moment to imagine a table set with two grain bowls: Fresh, raw peas, radishes, and red cabbage are piled over a bed of forbidden rice, named for its dark purple tint, with a poached, shredded chicken breast tucked in. 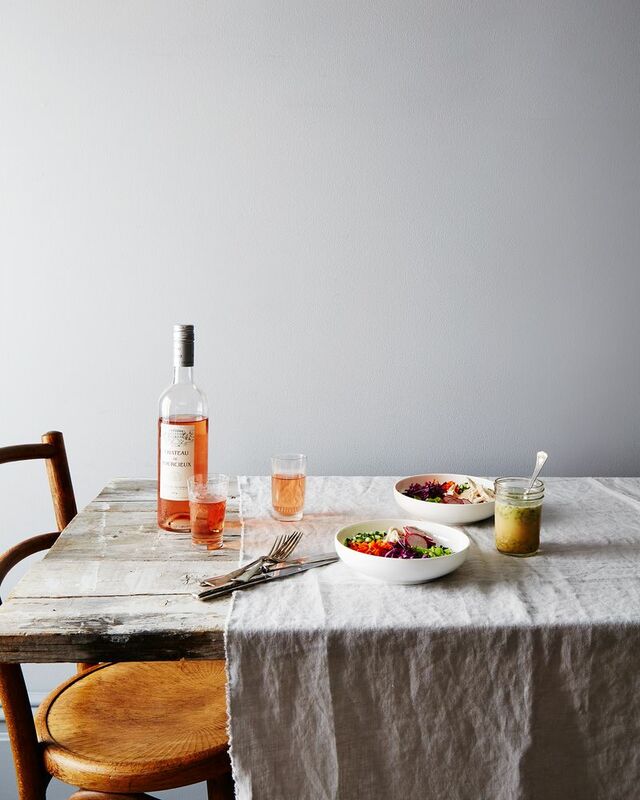 At their sides are two glasses of wine (presumably second servings, since this recipe is so simple that it encourages a glass while assembling the bowl) and an opaque, coconut milk-based dressing filled with bright and briny elements. In it is a clove of minced garlic, cilantro and mint, the zest and juice from an entire lime, a hearty dash of fish sauce, and just enough serrano to give a kick to the sweet coconut milk and a bit of added palm sugar. 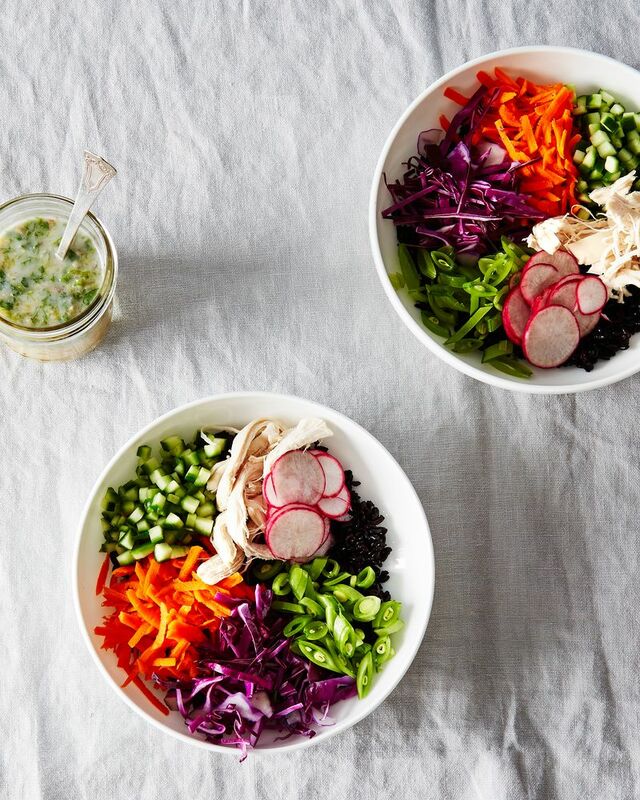 What's a go-to dressing you love that tops the salad (pun intended)? Tell us in the comments below! How long can the dressing be kept, you think? Do you mean teaspoons of zest? Two tablespoons is a lot. Super delicious and refreshing! The perfect spring/summer dinner. Your lobster noodle recipe sounds wonderful! I'm going to try that too! Sodium be damned!! If sodium is going to kill me - which it probably won't - let it be by the thickest fish sauce or the lovely brine that covers year old preserved lemons! This dressing sounds fantastic and similar to the dressing that my mother use to make whenever we had lobster (yeah, lobster). Since lobster was expensive (and still is in some areas), she made a noodle salad with rice vermicelli, julienned cucumbers, bean sprouts, shredded lettuce, and lots of fresh mint. It was a great way to stretch the lobster meat to feed a family of 8. Once the lobster and noodles were cooked, it was a matter of assembling. Each person made their own bowl, drizzled the sauce on top and mixed it up. Now I'm getting teary-eyed from the memories. This was my Dad's favorite meal.